There won't be any questions today, because, as a result of the 7/31/18 announced plan for "Forest City to be acquired by a fund of Brookfield Asset Management, the company will not conduct a third-quarter conference call with investors." That 7-5 vote by Forest City's board was highly contested, and is opposed by some members of Forest City's founding Ratner family. Forest City's Form 8-K, filed with the Securities and Exchange Commission, indicates that the two "100% affordable" buildings--both of which have had to offer incentives to get middle-income tenants to sign leases--have gotten closer to full. As of 10/25/18, 535 Carlton was 94% leased, and 38 Sixth was 80% leased. As of 4/26/18, 535 Carlton was 76% leased, and 38 Sixth was 47% leased. According to Forest City's 10-Q document filed with the SEC, 535 Carlton opened during the first two quarters of 2017, while 38 Sixth opened during the third and fourth quarters of that year. Note that that's a relatively gentle framing: leasing for 535 Carlton, for example, began in January 2017. Note that, as reported in July 2017, stabilization--steady revenue, presumably from nearly full lease-up--was expected for 535 Carlton by the second quarter of 2018 and for 38 Sixth by the third quarter of 2018. That's slower than once anticipated. In 2009, when KPMG estimated lease-up time for the project, it predicted middle-income rentals would take 7 months to lease up, and market-rate ones 11 months. Now even affordable middle-income rentals take a lot longer. 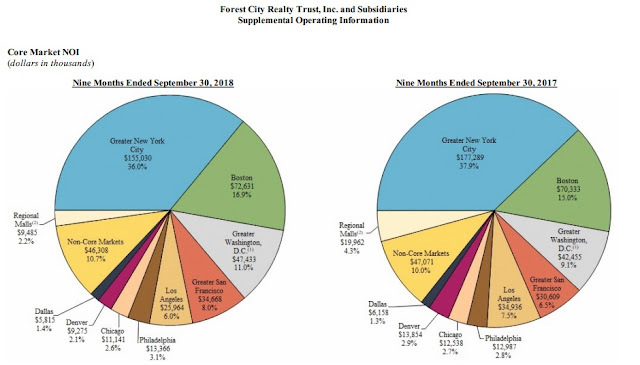 As the pie chart below indicates, Forest City's New York subsidiary, long Forest City Ratner Companies and now Forest City New York, contributes a disproportionate share of net operating income, now 36%. 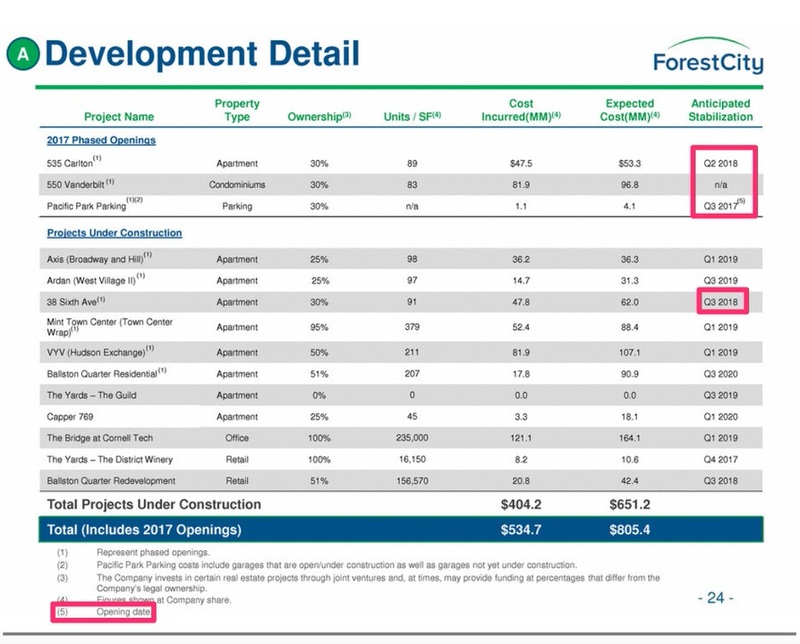 As indicated in the graphics below, Forest City Realty Trust has been lowering both its ratio of debt to earnings as well as its development ratio, which "is defined as total assets (less accumulated depreciation) divided by total projects under construction and development and land inventory." Both indicate more financially conservative practices. Pacific Park Brooklyn, a 22-acre mixed-use project, is located adjacent to the state-of-the-art arena, Barclays Center. At full build-out, Pacific Park Brooklyn is expected to feature more than 6,400 units of housing, including 2,250 affordable units, and more than 8 acres of landscaped open space. Included in the square feet of residential entitlements is 250,000 square feet of amenity retail that will reside in the base of the various buildings. The project is also currently entitled for approximately 1 million square feet of office space. Completed properties include 38 Sixth Ave, a 303-unit, 100% affordable rental building, 550 Vanderbilt, a 278-unit condominium building, 535 Carlton, a 100% affordable rental building with 298 apartment units and 461 Dean Street, a 50% market-rate and 50% affordable rental building with 363 apartment units, which was sold in Q1-2018. In June 2018, we closed an agreement with our partner, Greenland USA, on the restructuring of the Pacific Park Brooklyn joint venture. The transaction increased Greenland USA’s ownership interest in the joint venture from 70% to 95% on future construction activity, effective January 15, 2018, and significantly decreases our development risk at the project by reducing our ownership interest and future obligations to fund future construction costs from 30% to 5%. Completed projects of the joint venture, including 38 Sixth Ave, 550 Vanderbilt, 535 Carlton and the related parking garages, will remain owned by Greenland USA and us on a 70%/30% basis, respectively. This wasn't the first time this was stated, but do note that Greenland's obligation to pay more going forward began in January, even though the deal didn't close until June. No terms have been announced. According to Forest City's 10-Q document filed with the SEC, the debt on the Brooklyn Nets has been paid off. Note that, as reported 2/1/16 regarding Mikhail Prokhorov's purchase of Forest City's remaining shares of the team and the arena operating company, the purchase price for Nets Sports & Entertainment's (NS&E's) interest in the team was $125.1 million. 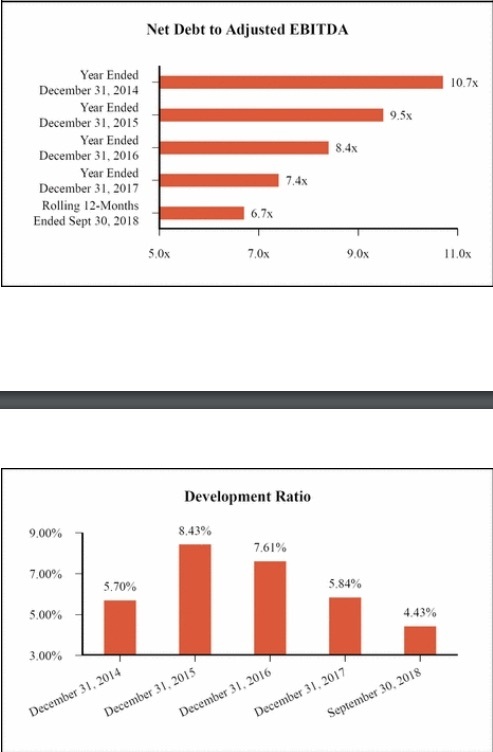 NS&E had to pay a 5.5-year promissory note totaling $125.1 million, with interest at relatively low 4.5% a year. In case Prokhorov sold or recapitalized (restructures) either asset, the deal requires accelerated repayment. Indeed, in April, he sold a minority share of the team to Joe Tsai, who's expected to buy the rest. The purchase price for NS&E's interest in the arena operating company was $162.6 million. NS&E got $70 million in cash at closing, before transfer taxes and closing costs, which lowered the take to $54 million. Prokhorov also offered a 3-year promissory note totaling $92.6 million, again paying 4.5%. That debt should be paid off by January 2019.